Sometimes you just need a great basic cookie, right? I'll confess that I'm more of an oatmeal raisin fan than an oatmeal chocolate chip fan (don't hate!) but Geoff is all about the chocolate chips. (He's kind of convinced that if it has fruit in it, it's health food and not dessert... sigh.) Anyway, these cookies! They have a really great texture... chewy in the middle and crispy on the outside. And the gooey melted chocolate chips make them extra special. I think these would also be really great with some coconut tossed in... so yummy! Beware that the recipe makes a ton... I usually freeze half the dough for later because it makes way more than we can eat. 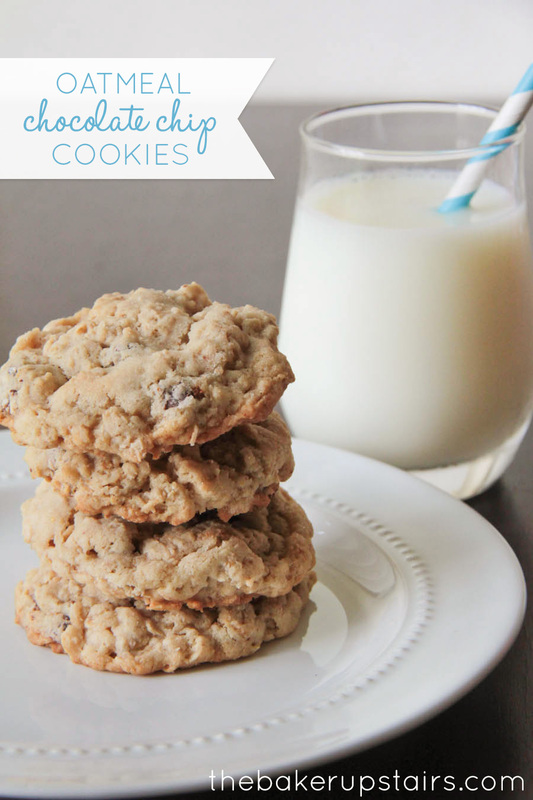 As oatmeal cookies go, these are pretty much just perfect! Preheat oven to 350. In a large bowl or the bowl of a stand mixer, cream together butter and sugar. Add eggs and vanilla, and mix well. Add baking soda, baking powder, salt, flour, and oats, and mix until just combined. Fold in chocolate chips. Scoop onto a lightly greased baking sheet and bake 10-12 minutes, or until lightly browned.